The new moon is the morning of August 12th (2:30am), so the nights of August 10th into the 11th and the 11th into the 12th will be the darkest nights of the month and therefore the best time to observe the more faint objects like galaxies and star clusters. Grab your gear and enjoy! Orion StarShoot All-In-One Astrophotography Camera. Two great nights to enjoy Perseid watching! Go outside on the evening of August 11th and/or after midnight on August 12th for the best chances to see the peak of the Perseids meteor shower. 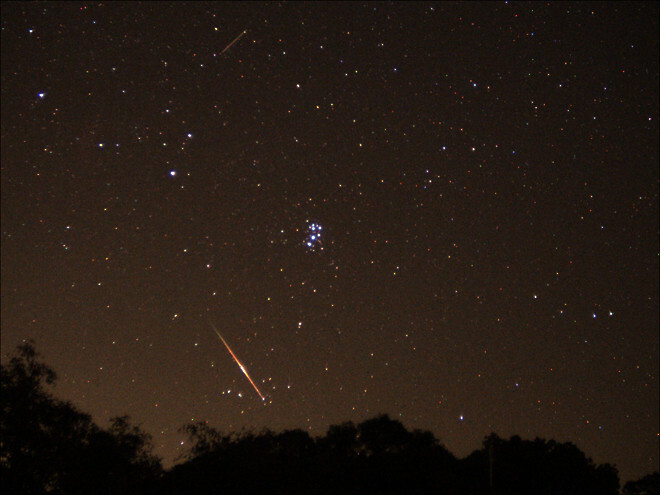 With up to 60 meteors expected per hour, this is one of the most popular meteor showers of the year. Conditions will be excellent this year since the thin crescent Moon will set early on the 12th, providing dark skies. After sunset on August 17th, bright planet Venus will be at its greatest eastern elongation, reaching its highest point in the sky. Look above the western horizon right after the Sun sets to catch a glimpse of our next-door neighbor planet in a telescope. Many excellent examples of gaseous nebulas are on display in the skies of August. The brightest are M16 the Eagle Nebula, M17 the Swan Nebula, M20 the Trifid Nebula and the very bright M8, Lagoon Nebula. All are visible in binoculars from dark locations with good seeing. Use a small to moderate aperture telescope with the aid of an Oxygen-III eyepiece filter or Broadband SkyGlow Filter to see these nebulas from locations plagued by light pollution. Our challenge this month is a surprisingly easy object to see with a telescope, but not so easy with binoculars. Look for M27, the Dumbbell Nebula in the constellation of Vulpecula, just south of Cygnus. M27 is one of the nearest and brightest planetary nebulas visible from Earth. It's so big that it can be spotted in humble 7 x 50 binoculars, but it does present a challenge! Try to track M27 down this August with your binoculars; it will be a small dot, slightly larger than the surrounding stars, but definitely visible through 50mm or larger binoculars.